Fantástico loft de 110 m2 aonde você se sentirá como em casa. Este apartamento lhe dá uma sensação espectacular de espaço e de luz, totalmente coberto de parqué. A cozinha americana de novo desenho e o grande salão-sala de jantar lhe dão um espaço total de 48 m2. O salão é especialmente iluminado graças a? janela panorâmica de 6 m. A cozinha está totalmente equipada com frigorífico, micro-ondas-grill, cafeteira italiana, torradeira, e para todas as travessas e pratos que você precise. O apartamento tem 2 quartos de banho, um privado do suite e outro comum aos 2 outros quartos (Os 2 estão equipados de duches). O salão-sala de jantar lhe oferece todas as comodidades que você tem o direito de esperar para um apartamento de esta categoria: uma televisão satélite de 25 polegadas, Internet WIFI (sem fio), um leitor CD Radio, um sofá confortável e 2 poltronas individuais. Os 2 quartos de banhos estão equipados de banhos, lavatórios e duches. O apartamento está completamente equipado de ar-condicionado e aquecimento central. Nós ainda lhe fornecemos uma máquina de lavar e secar bem como uma mesa e ferro para passar roupa. Uma pequena cama de bebe está disponível se for necessário. O prédio tem ascensor. This is wonderful property; clean; as advertised; great location. Can not say enough good things. Frederic was tremendous. Accommodating, informative and helpful. The apartment is beautiful, bright and clean. The beds very comfortable. The check-in was simple; the check-out was simple. It is in a great location, within walking distance to Sagrada Familia and other great sites. Thank you Frederic. Fredericks apartment was exactly as pictured. It was very clean, attractive, and a good location. Fredericks apartment in the Eixample district of Barcelona was a great location being close to the Sarada Familia, Sant Pau Hospital, the metro, restaurants, and markets. We were a family of five and there was plenty of space. The beds were comfortable, bathrooms were as pictured with good lighting and great showers. The kitchen had ample counter space and the cooking equipment needed. There was no dishwasher but this was not a problem to us as breakfast was the only meal we fixed. The markets across the street provided us with wonderful fruit and delicious chocolate croissants! The lighting, both natural and lamps was excellent which is something lacking in many apartments. Fredericks assistant provided us with good information as to location of sights and restaurant recommendations. They also had travel books available and novels. We had a great time in Barcelona and would highly recommend Fredericks apartment. I forgot to mention the elevator . We appreciated not having to climb stairs after a long day of sight seeing. Frederic was quick to respond and also accommodated a few of our special requests. He is a great host. We had 3 adult couples in our family and this apartment had privacy for everyone and also space and seating in the common area for us to gather. 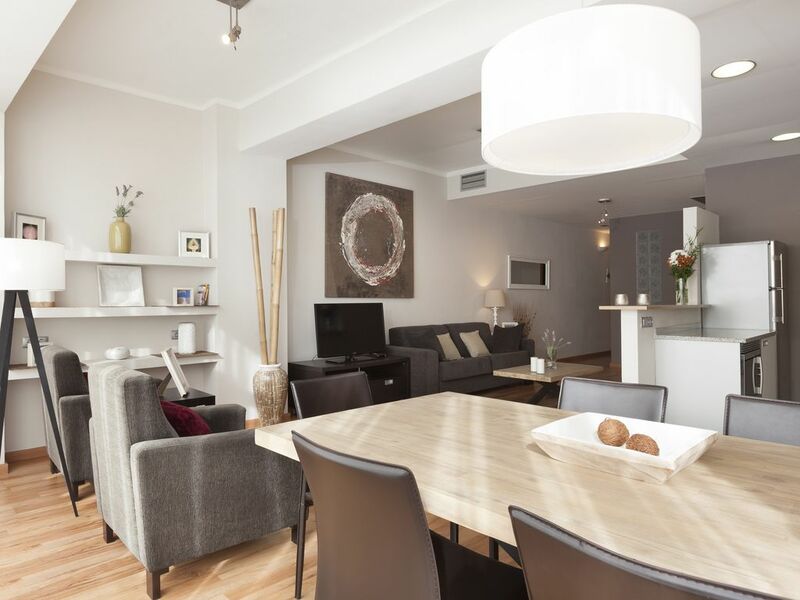 Within walking distance to Sagrada Familia and a 4 minute walk to metro. We purchased 10 ticket passes - inexpensive and you can share the pass. So using metro was easy and brought us almost everywhere in Barcelona in 20 or 30 minutes from this apartment. This is a bright new apartment with comfortable beds and well equipped kitchen. It is a quiet building yet steps away from bakery, grocery, bars, and restaurants. It suited our large family group very well. Lovely, clean, and spacious. The location was great and was very accessible to all the great sights. They were very helpful and accommodating. I would definitely stay here again and highly recommend it. This apartment was a fantastic home base for our family of five during our week in Barcelona. It is spacious and full of light, and the decor is both elegant and calming. Our friends stayed in the apartment downstairs and it was perfect to have this option for a group trip. Frederic and his team were excellent and professional hosts. And the location was great: close to metro stops, with nice restaurants and grocery stores within a few blocks. I recommend this apartment highly. A localização deste apartamento é excelente e muito central, a só alguns minutos a pé de famosa Sagrada Família, a catedral do arquiteto Gaudi (bairro de eixample) no centro de Barcelona. Junto a Sagrada Família você encontrará uma parada de ónibus turística. Outro punto de interes é umas das paradas da ruta modernista (com o mesmo nome que a Sagrada Família é o hospital Sant Pau, sem duvida nenhuma o hospital mais extravagante que você nunca viu! O bairro é particularmente tranquilo e muito seguro para passear uma vez que anoiteça. A só 20m do apartamento encontrará 3 supermercados, uma excelente padaria- pastelaria aonde poderá comprar croissants muito bons para seu pequeno-almoço. A linha azul fica a só 2 minutos a pé do apartamento e em 10 minutos chegará ao P de Garcia e em 15 mn com a linha 2 estará na Plaça de Catalunya e as ramblas. Un accompte de 25% est demandé pour faire efective la réservation. Le reste à payer se fait à la remise des clefs. Prix de base annoncé pour 2 personnes adultes hors taxes. Prévoir un supplément par personne de 15 euros à partir de la 3ème personne. Prévoir 10% de TVA en sus. Par exemple, le prix par jour pour 4 personnes en haute et trés haute saison serait de 155 euros (+10% TVA).